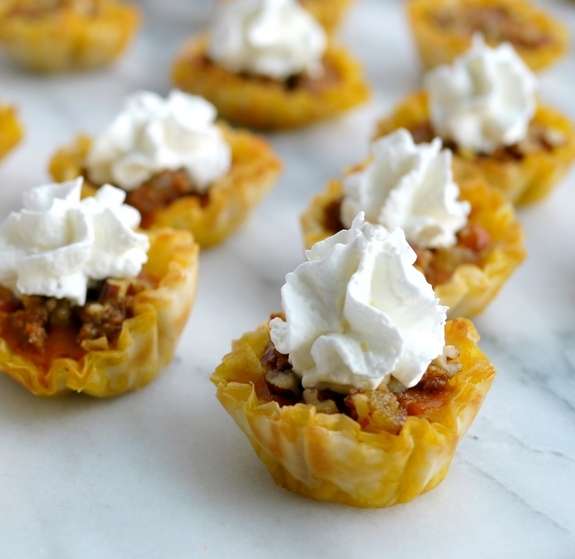 These Pumpkin Pie Bites with Gingerbread Streusel knock tradition on its ear, but who says you have to follow the rules when it comes to dessert? 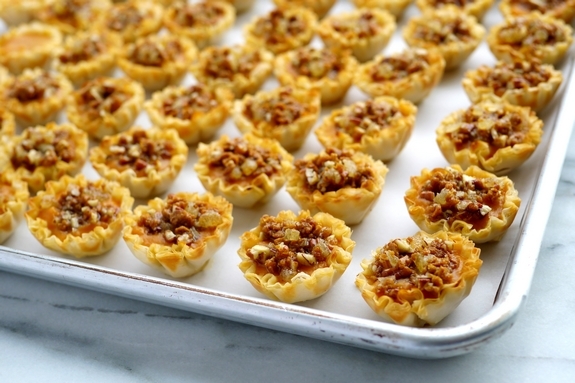 Make the holiday easy on yourself and enjoy this quick and easy mini dessert throughout the season. When it comes to pumpkin pie are you a traditionalist? Whipped cream only on top or none at all? 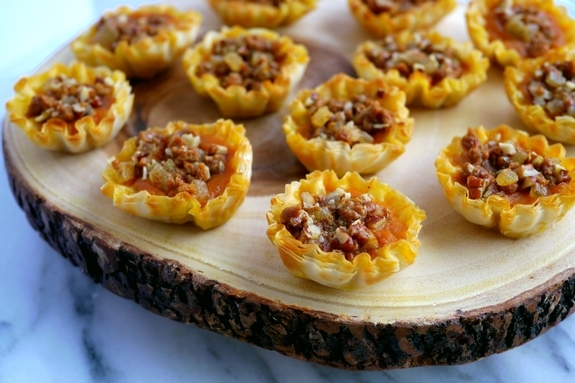 How about adding some pizzazz by changing up the way regular pumpkin pie is served and tastes, I promise it will be delicious. Yes, everyone loves traditional apple pie with the perfect crust, however I also tend to lean on the side of non-traditional apple pie too. 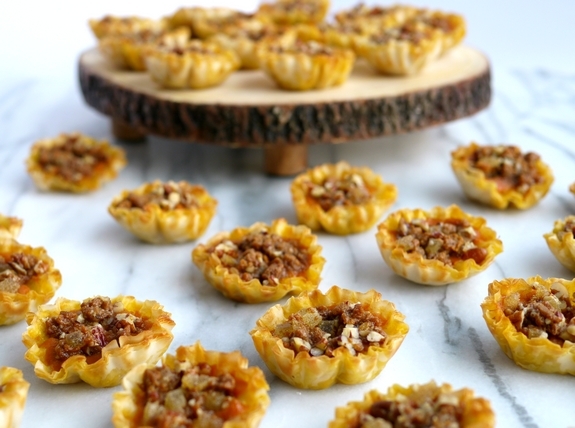 Heck, I even love mini apples pies…let’s face it apple pie is definitely a favorite. However, I am always willing to throw caution to the wind with pumpkin pie and try something different. 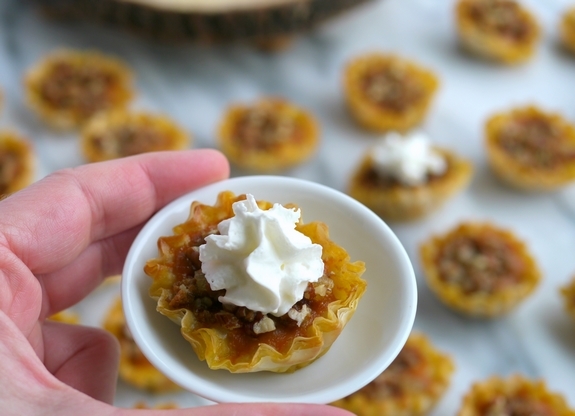 These Pumpkin Pie Bites with Gingerbread Streusel are so simple to make and have that little something-something that traditional pumpkin pie does not have. You can also leave a few these without the gingerbread streusel if you have someone with an aversion or an allergy to nuts. So tell me, who is going to complain the most that you tinkered with their regular pumpkin pie? Your gandmother? Uncle? Trust me, they are going to be okay. 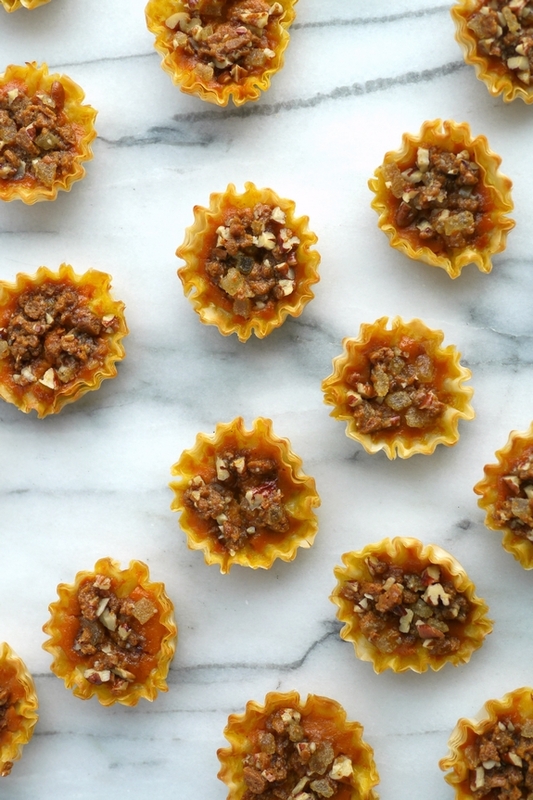 The flavor with the spicy streusel is subtle, but bold enough to know that it’s different. Perfect for the dessert buffet, but is also perfect for a passed dessert if that is a thing at your house. Bet you thought I forgot the whipped cream? One bite and everyone will be asking for seconds. Desserts don’t always have to be traditional and it’s always fun to throw something new into the mix. I bet your guests would love to dive into this Pumpkin Cinnamon Ripple Ice Cream Pie or have a scoop or two of this Cranberry Sorbet. This Fresh Pear and Ginger Crumble is one of my favorites. Pumpkin Tiramisu or Pumpkin Creme Brulee anyone? Preheat oven to 350 degrees F. Prepare two large baking sheets with parchment paper. In a large bowl, beat together eggs, pumpkin pie mixture, evaporated milk and maple syrup. Set aside. In a medium sized bowl, combine all ingredients for the streusel until the gingersnaps are saturated with butter. 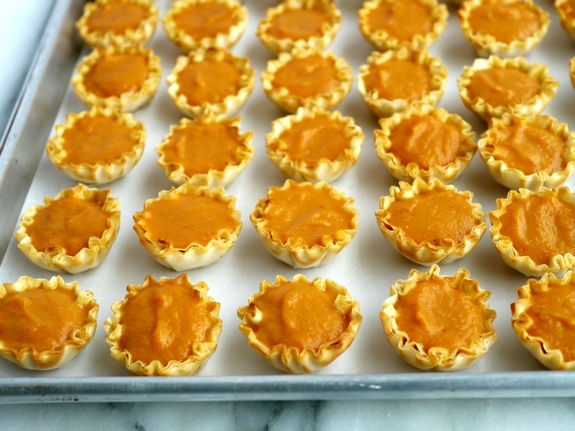 Remove fillo shells from the freezer one box at a time as you need them and fill them to the top with pumpkin pie mixture. 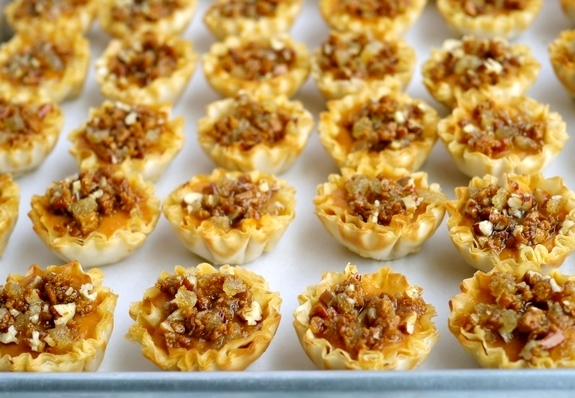 Top each filled shell with the streusel mixture. Place them in the oven immediately. You do not want these sitting out for a long time to soften the integrity of the crust. Bake for 18-20 minutes or until the filling is set.